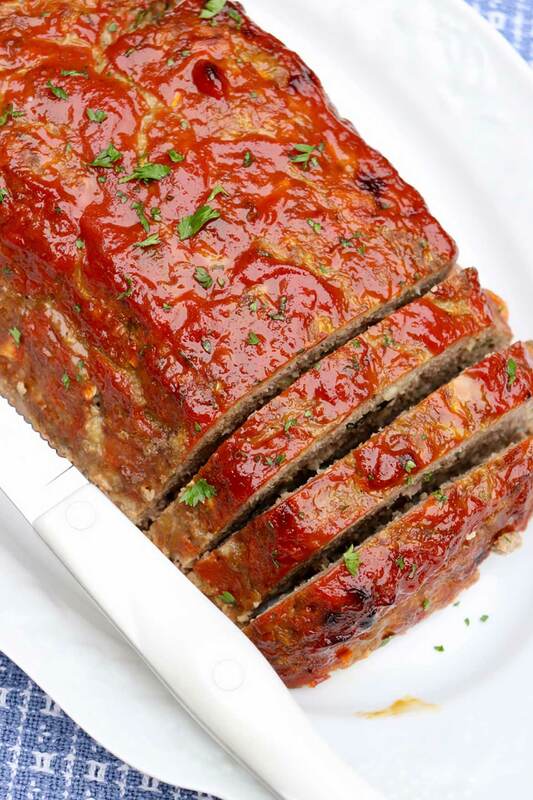 Family Favorite Glazed Meatloaf tastes great and slices perfectly! The recipe also offers prep ahead convenience and tips for a perfectly shaped loaf. Most children are discouraged from playing with their food. I learned this lesson at a young age, but as I get older, I occasionally ignore this piece of advice. Let’s face it. There’s a lot of bad news in this world. Headlines too often tell of violence and despair. Friends get sick, kids get bullied, and Mother Nature wreaks havoc. I decided long ago that my little place in the newspaper and online should be a happy one. A recipe won’t create world peace, but perhaps the story behind it can shine a light on good causes, great people, and maybe even some silly antics. April Fool’s Day is the perfect excuse to have fun with your food. Over the years, I’ve served April Fool’s fruit punch for an after school snack and meatloaf “cake” for a memorable dinner. The easy fruit punch trick produced peals of laughter. The cake didn’t truly fool anyone but it sure was fun. To add a fun April Fool’s twist to this family favorite meal, click on the photo. 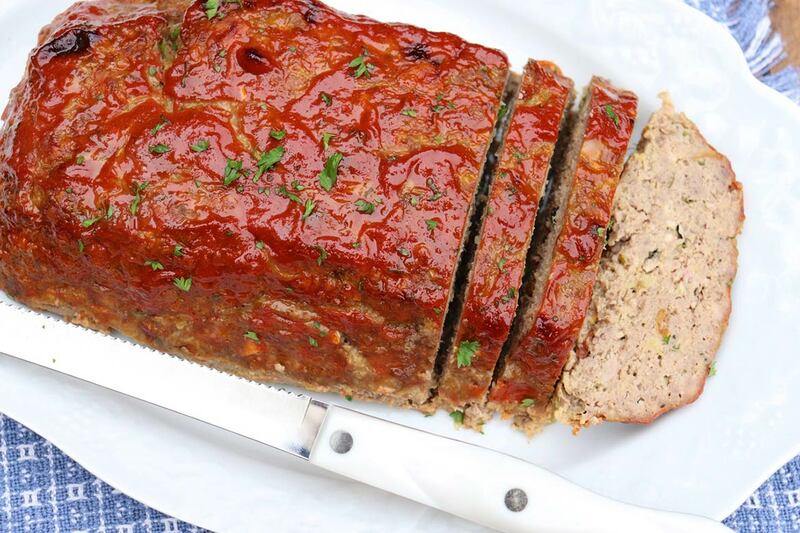 Of course, a meatloaf baked in a cake pan and frosted with mashed potatoes is fitting on April 1st, but on the other 364 days of the year, most people would disregard the gimmick. I, however, make that same meatloaf frequently throughout the year, swapping the “frosting” for a lightly tangy, three-ingredient glaze. For a perfectly shaped loaf that cooks evenly, see the tip in the recipe instructions. A small amount of sausage enhances the flavor of this easy-to-assemble meal, and the right amount of binders ensures easy slicing. In all my years of making meatloaves, this is the only one for which no one reaches for ketchup—except my brother Bill, whose love of ketchup is limitless! Technically speaking, the glaze does provide a hint of ketchup flavor that caramelizes beautifully as the loaf bakes. Hi, My mom used 1/3 rd each of ground pork, beef and veal…of course in the middle was the hidden hard boiled egg. Her glaze was a heated can of bing dark cherries thickened with a little corn starch and served piping hot over your serving….yum. Thanks so much for letting me know, Jacob. 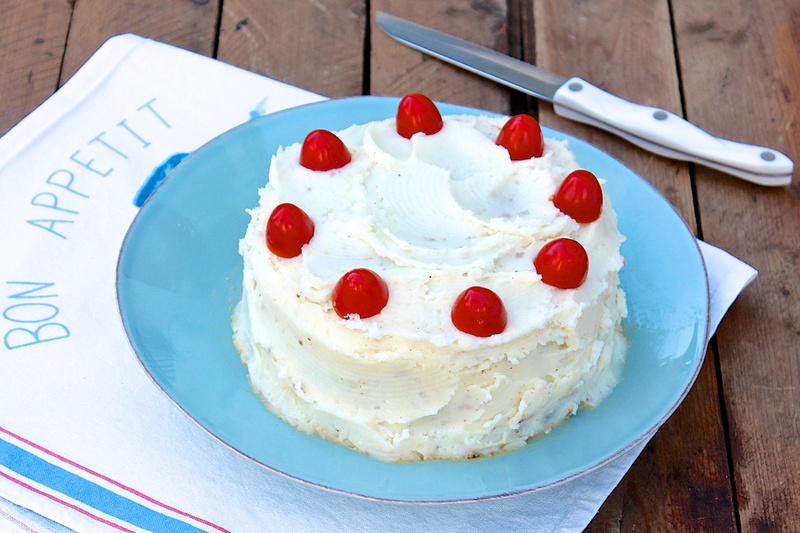 The cherry topping is a new twist—I’ve never heard of that—and I love the hidden egg! OMG. This was the best meatloaf I’ve ever had. It’s going into the weekly rotation. Thank you!! Awesome news, Denise! I’m delighted it’s a keeper! 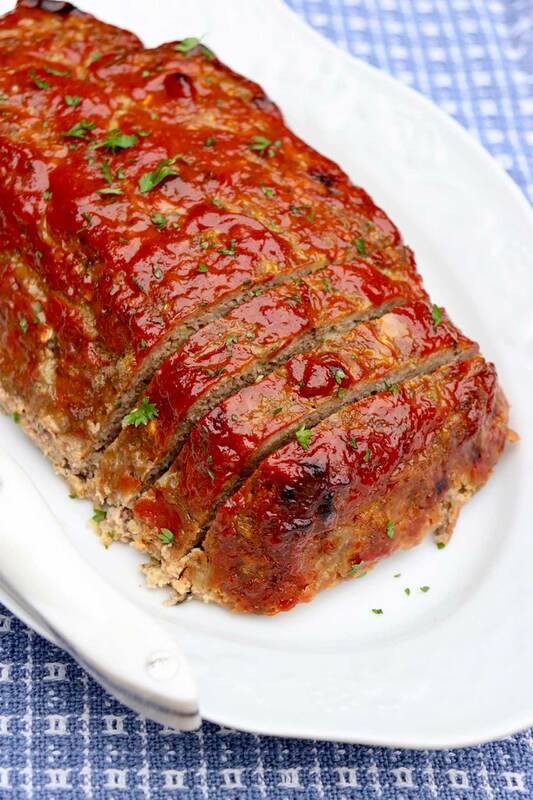 Utterly delicious meatloaf! Made this recipe last night for dinner and just enjoyed meatloaf sandwiches for lunch. Will make again soon! Yay! So happy it was a hit, Tina. I love meatloaf! And I don’t think it gets the respect it deserves. I’ll try this for sure. I’m sure it’ll be yummy. Even the photos are making me drool. I wholeheartedly agree, Maya! So happy this caught your eye. I hope it hits the spot! Cooking for one now and am wondering if the recipe could be divided in half. One for now and one in the freezer for later. 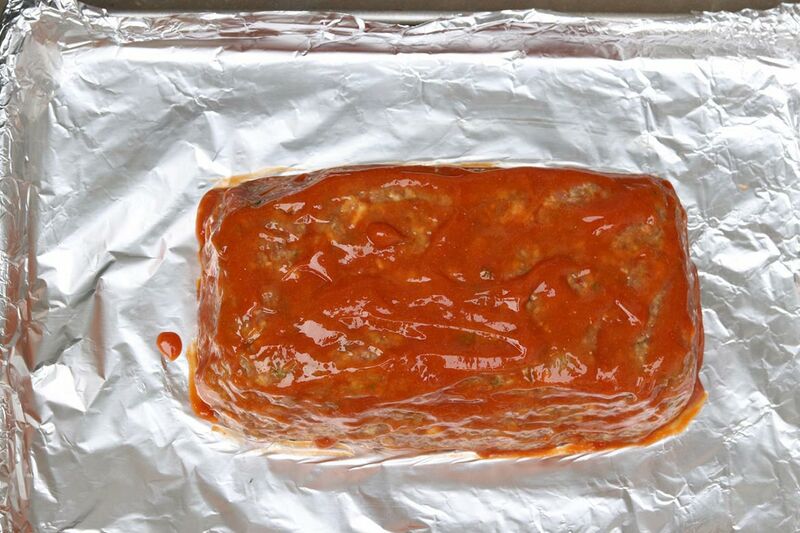 How long would you cook a smaller meatloaf? Many thanks! Hi Marsha, You could absolutely divide the loaf in half or make three mini loaves. For the mini loaves, I’d reduce the oven temperature to 350 and figure they will take 40 minutes, give or take, depending on oven and precise size and shape of loaf. You could also bake a full loaf as directed and freeze one of the halves or individual slices. Enjoy! Hi Ann, Have you ever tried this with turkey? Thanks! Hi Bridget, I haven’t but I think it would work well. If you happen to try, please report back!